Researchers at Eindhoven University of Technology (TU/e) in the Netherlands and the University of Central Florida (CREOL) in the USA, report in the journal Nature Photonics the successful transmission of a record high 255 Terabits/s over a new type of fibre allowing 21 times more bandwidth than currently available in communication networks. 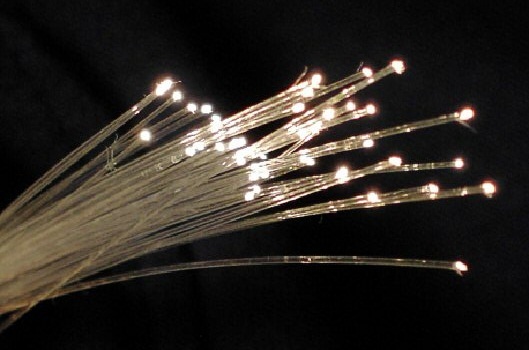 This new type of fibre could be an answer to mitigating the impending optical transmission capacity crunch caused by the increasing bandwidth demand. Due to the popularity of Internet services and emerging network of capacity-hungry datacentres, demand for telecommunication bandwidth is expected to continue at an exponential rate. To transmit more information through current optical glass fibres, an option is to increase the power of the signals to overcome the losses inherent in the glass from which the fibre is manufactured. However, this produces unwanted photonic nonlinear effects, which limit the amount of information that can be recovered after transmission over the standard fibre. The team at TU/e and CREOL, led by dr. Chigo Okonkwo, an assistant professor in the Electro-Optical Communications (ECO) research group at TU/e and dr. Rodrigo Amezcua Correa, a research assistant professor in Micro-structured fibres at CREOL, demonstrate the potential of a new class of fibre to increase transmission capacity and mitigate the impending ‘capacity crunch’ in their article that appeared yesterday in the online edition of the journal Nature Photonics. The new fibre has seven different cores through which the light can travel, instead of one in current state-of-the-art fibres. This compares to going from a one-way road to a seven-lane highway. Also, they introduce two additional orthogonal dimensions for data transportation – as if three cars can drive on top of each other in the same lane. Combining those two methods, they achieve a gross transmission throughput of 255 Terabits/s over the fibre link. This is more than 20 times the current standard of 4-8 Terabits/s.